I was very pleased to read Vic Bradley‘s account of the "Last Train to Toury" in RECORD 7 but feel that he did the Tramway de Pithiviers Toury an injustice in his second paragraph. It was not the TPT who "decided to drop its fires in favour of road transport" but the sugar factories at Toury and Pithiviers. As these factories provided the bulk of the TPT’s traffic there was no alternative to closure. Through the courtesy of the Federation des Amis des Chemins de Fer Secondaires and my Paris correspondent Monsieur Rozé I am able to complete the picture so far as the disposal of the steam locomotives is concerned. Unfortunately Vic’s optimism over the Hunslet returning to England was not justified in the event as this locomotive, together with three of the 0−8−0T (not 0−6−0T as printed in the RECORD), was scrapped soon after the trip so well described in Vic’s article. Although I have been unable to find out its destination, one locomotive, however, has come to England. This is TPT No. 3.23 (Alco 2−6−2T), sold to a Mr Ransom, which left Pithiviers on 25th June 1965. The other two 2−6−2T (3.20, 3.22), the 0−10−0T (5.3) and one each of the 0−6−0T (3.6) and 0−8−0T, (4.14 21) have been acquired by a private collector (Monsieur Bayon - member of the F.A.C.S. ), the Orenstein & Koppel Mallet 0−4−4−0T (22.5) and another 0−8−0T (4.13) have been acquired by the enthusiast operated Chemin de Fer Touristique de Meyzieu, near Lyon, whilst the remaining 0−6−0T (3.5) and 0−8−0T (4.12), together with the Crochat petrol-electric railcar and some rolling stock, have been purchased by the F.A.C.S. and will probably go to the Malakoff Museum in Paris. There is some talk of a "living" museum being established at Pithiviers and the Loiret Departmental authorities who operated the TPT are understood to be sympathetic towards the idea of the depot and a few km of track at Pithiviers being retained for the purpose. Certainly there seems to be no hurry to clear away the TPT from Pithiviers for in September this year all nine locomotives for preservation in France were still there, only the Alco having left for England. If, as is to be hoped, the living museum is established at Pithiviers, the Beauce will, after all, retain an attraction. 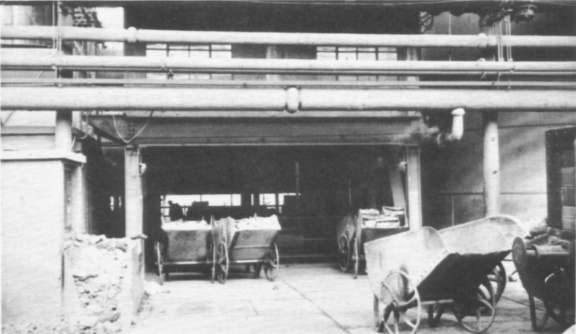 I found the article in RECORD 5/6 very interesting, but would like to point out that the wheelbarrows mentioned in paragraph two on page 103 are by no means unique, as I have noticed them in use at other furnaces (as well as at coaling plants on British Railways arid the Great Northern Railway of Ireland). In addition to iron ore, the barrows at Kettering were used to take coke, lime and scrap-iron to the furnace tops. I was able to photograph them in June 1958. On page 58 of RECORD 3/4 there was a reference to a letter found by Mr Paar in the B.T.C. archives, written by Charles Richardson, engineer to the Bristol and South Wales Union Railway, on 24th February 1864, to G.W. Keeling, engineer of the Severn and Wye Railway and Canal Company, informing him that Mr Brotherhood (the contractor) was at that time using two vertical boiler locomotives by Brown and Company, London. As the London office of Brown and of the North Wiltshire Foundry, Devizes, was at the same address, it was assumed by the Hon. Ed. that these locomotives were built by the Devizes firm. The address of J.B. Brown and Company was 18, Cannon Street, City, E.C., with workshops at 148, Upper Thames Street, and in Vol.1, No.1, of "Engineering" for 5th January 1866, this firm advertised for sale from stock, contractors saddle tank locomotives, portable steam engines and boilers, steam cranes and hoisting engines. In the same issue of "Engineering", Brown and May advertised portable and fixed steam engines, and named Stephen Holman, also of 18, Cannon Street, City, E.C., as their London agent, with a warehouse at 10, Laurence Pountney Lane, E.C. It would seem, therefore, that the two locomotives mentioned by Charles Richardson are more likely to have been built by J.B. Brown and Company than Brown and May. Were the workshops at Upper Thames Street large enough to produce the type of plant as illustrated in the advert? Perhaps they were, for customers were invited to visit the workshops and inspect one of their stationary engines employed in driving the workshop machinery. To many enthusiasts the internal combustion locomotive is little more than a noisy, smelly, upstart of a box-on-wheels and, although I admit that nothing can ever match the steam locomotive in appearance and sound, I think it is a pity that the internal combustion locomotive has been so neglected by the majority of enthusiasts. Since 1960 I have devoted much time to redress the balance and am trying to cover all firms in the British Isles which have built internal combustion locomotives. One of the most interesting firms is Baguley which has had no less than four works in Burton-on-Trent, and has sold locomotives under McEwan Pratt, Drewry, Baguley, Associated Electrical Industries, and English Electric name plates. In addition they have built road lorries, railcars, railway rolling stock, railway inspection cars, petrol engines for rail and road vehicles, as well as other odds and ends which include a steam charabanc! They have also traded under three different names - Baguley (Cars) Ltd., Baguley (Engineers) Ltd., and E. E. Baguley Ltd.
May I appeal to your readers for assistance with my study of internal combustion locomotives? I shall be pleased to hear from anyone with magazine references, factual unpublished material, and photographs of ANY i.c. locomotives which can be loaned for checking purposes. My address is:- 3, Cambridge Place, Falsgrave, SCARBOROUGH, Yorkshire. I was glad that my letter was published in RECORD 5/6 as it brought me letters from C. G. Down and M. H. Billington. 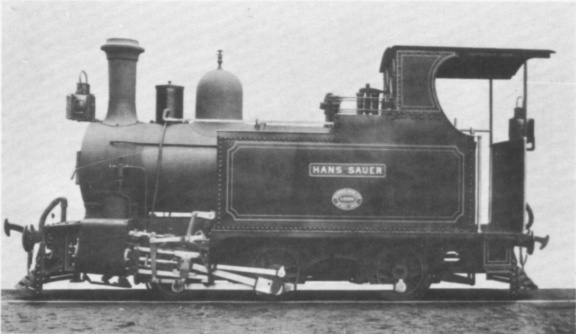 The latter recalled HANS SAUER and was able to send me a photostat illustration showing it in its original state as a 0−6−0 side tank, built by Hunslet in 1905 (works No.867), My reference to it being German was only a guess from information given me by an old Rhodesia Railways pensioner. I imagine that when HANS SAUER arrived at the Ayrshire Mine it was found to be too good to be used solely as a shunting engine. A spare Falcon (ex−Beira Railway) tender was added and, after an alteration to the cab, the Hunslet went into service on the "main line" between Ayrshire Mine and Salisbury. Being more powerful than the Falcons, shifting more loads, it was very popular. About 1916 it was sold to the Selukwe Peak Light Rly., a 6 mile line from a chrome mine to the Rhodesia Railways station at Selukwe. HANS SAUER was scrapped as far as I can trace somewhere in the 1930’s, but the S.P.L.R. is still running with several diesels and a few steam shunters. You may be interested to hear of a 2ft gauge 0−4−0 side tank built by Andrew Barclay in 1898 (works No.826) for the City of Cape Town Corporation, which has been at the top of Table Mountain ever since. It was imported for the construction of reservoirs (for local water supplies) on Table Mountain. The stone for the dams was quarried from the Buttress of the mountain above Camps Bay and the railway ran for about a mile-and-a-half, serving stone dumps and a block-making depot. The locomotive has been kept in a shed in the Ranger‘s storage area ever since its use on the reservoirs, but there is now a proposal afoot to have it brought down for display. FISH HOEK, CAPE, SOUTH AFRICA. I have been impressed by the drawings that have appeared in the RECORD, but have one small criticism in that with locomotives only the side elevation has been shown. If there is not room for an end elevation, could the width over footplate, tank and cab be included in the text? Perhaps, too, one issue could carry the end elevations of the engines depicted in the two previous issues. Of course, the best place for an end would be with the side.